Are you wondering where to buy journals? Right here! You've found the authors' website, and we're happy to help you choose just the right memory journal. These delightful memory journals have warmed the hearts of thousands! Those who have written in them have reported that the books' questions cause memories to come flooding back and they loved the experience of recording their very unique histories. The stories written will share events, feelings, experiences and history, making any completed journal a treasured genealogy book. Every family who has received a completed family memory book has been given an heirloom to treasure forever. Our memory journals are a wonderful family gift idea that is unique yet reasonably priced. 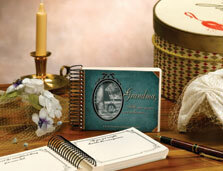 Our memory book ideas are a great fit for every friend and relative on your gift list! Our grandparent and parent journals are a wonderful way to pass down childhood stories to the young people in your life. Our sisters books are a celebration of the many experiences shared while growing up together. Unique and enlightening journals designed specifically for children are a great way for kids to capture the memories of youth as they happen! The long time friend journal will help you relive those cherished moments of your friendship forever. The recollections journal is a wonderful way to record precious memories of youth to share with ANYONE!! For more information on specific memory book ideas, choose a category from the above Memory Journals link. To enjoy stories, memories, and anecdotes our memory journals have inspired, choose the Testimonials button above or visit our Facebook page. If your non-profit group or organization is looking for fund raising ideas, email us to receive information on the unique way memory journals can be introduced into the lives of those you know. Thank you for visiting our site. We hope you will enjoy recording your history in one of our memory journals soon!